Today small, family run potato farms are fast disappearing and with them, the tradition of the hand picking harvest. The Maine Potato Board estimates that only one to two percent of potatoes now harvested in Aroostook County are gathered in baskets and barrels. 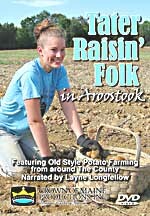 “Tater Raisin’ Folk” captures the sights and sounds of the handpicked potato harvest at a few of the farms where the tradition still takes place in The County. The show begins at planting time, features the Potato Blossom Festival at Fort Fairfield, and ends with the harvest at farms dotted around The County. Visit the Smith's Farm in Houlton where a wooden bear welcomes customers at their roadside stand; get off the beaten track in Bridgewater and discover how the Gerritsen’s at Wood Prairie Farm are bucking the trend by going organic; take in the scenes at Dan Stewart’s Family Farm in Presque Isle where young pickers fill their baskets under the watchful eye of Dan and his faithful friend, Rex; witness the fun of picking at Clayton Patrick’s in Woodland with barrels from the 1940’s, and don’t miss the excitement at Phil Nadeau’s Farm in Frenchville when he tries out his re-built potato elevator made from parts he found on the side of the road. This is old time potato farming at its best with unforgettable characters at work in stunning locations from around The County. “Tater Raisin’ Folk” will make you laugh, and it will make you cry. 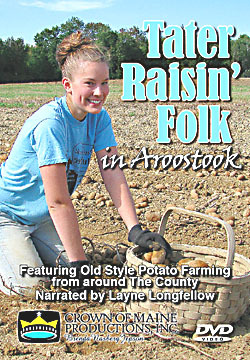 Most of all, this show reveals what inspires these “Tater Raisin’ Folk.” To be shown on Maine Public Broadcasting Network in November.